Building for my kids is perhaps the most fun and a great source of pride as a momma. 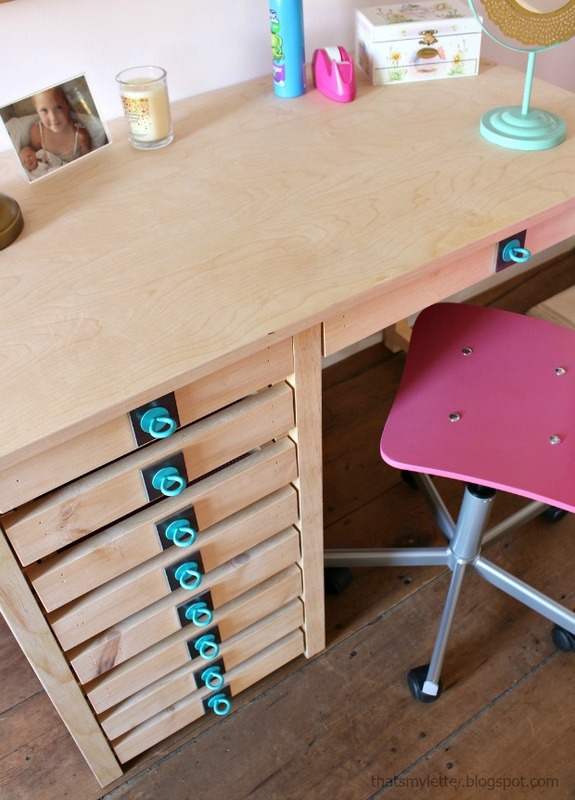 Today I’m sharing how to build this vanity desk including these unique drawer pulls made from Simpson Strong-Tie® hardware. This desk is generous in size, average but not too small, really it’s perfect for anyone. All the details including step-by-step instructions are down below but first let me show you the finished piece. 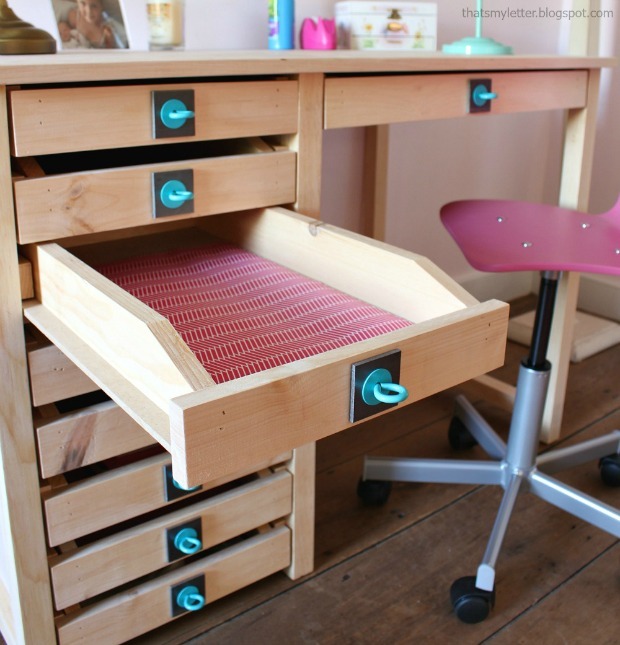 There are eight smaller drawers on the left and one large wider drawer at the top great for storing all sorts of accessories and supplies. My daughter has filled it up with hair supplies, play make-up, papers and journals plus lots of keepsakes. 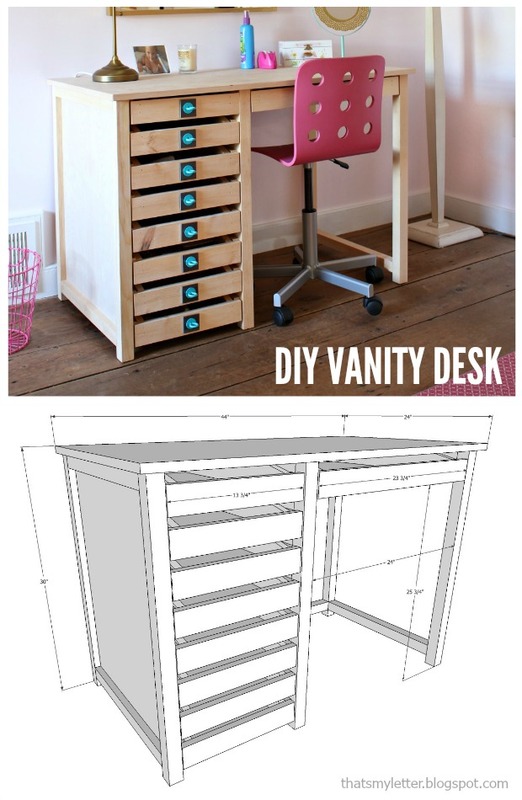 This vanity style desk is personal space to call your own while everything stays tidy in the drawers. 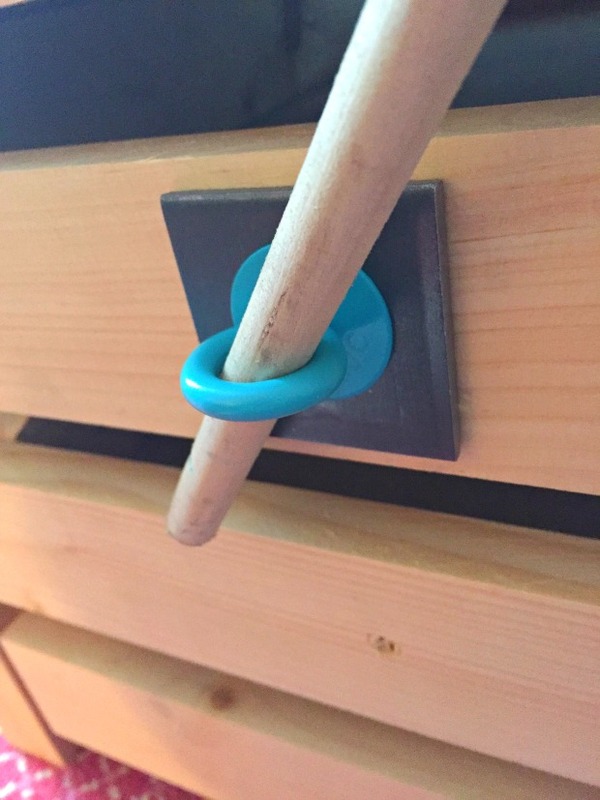 I designed the drawer pulls using a screw eye, washer and Simpson Strong-Tie® bearing plate. 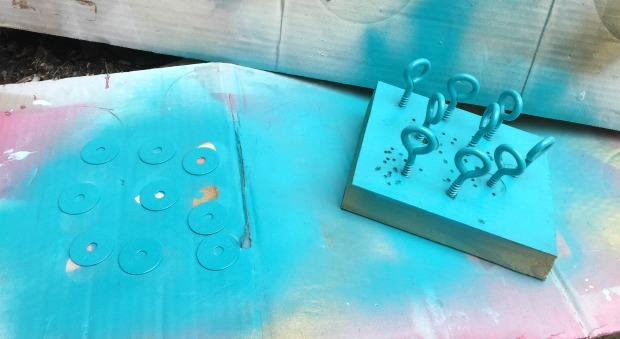 Prior to assembly I spray painted the screw eye and washer a glossy aqua blue for contrast, painting the pulls is an easy way to add color without making the entire desk a flashy eyesore. 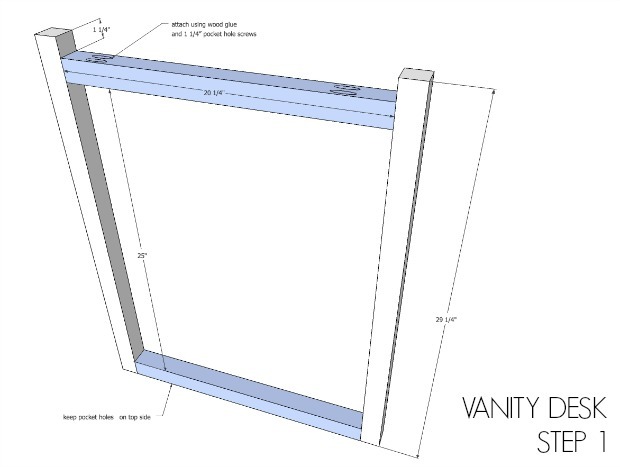 The building plans are designed to use wood boards as drawer glides versus metal drawer glides. 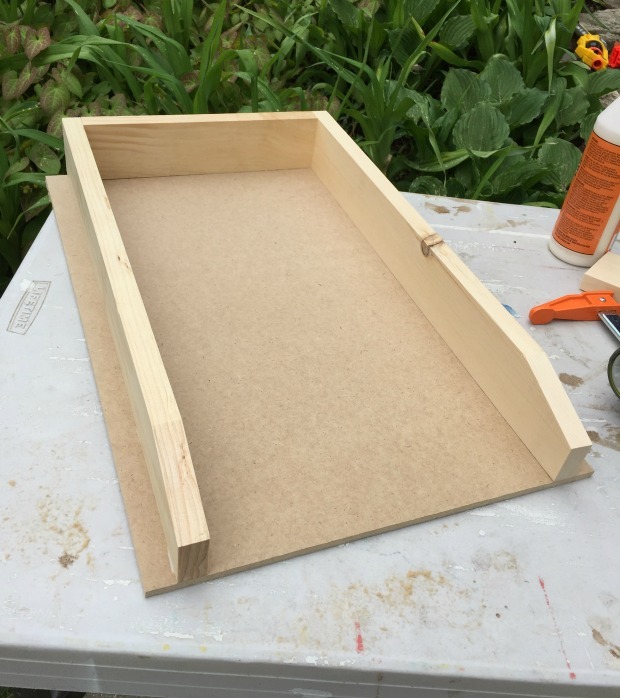 One upper and one lower board create a track while the base of the drawer glides along the track. 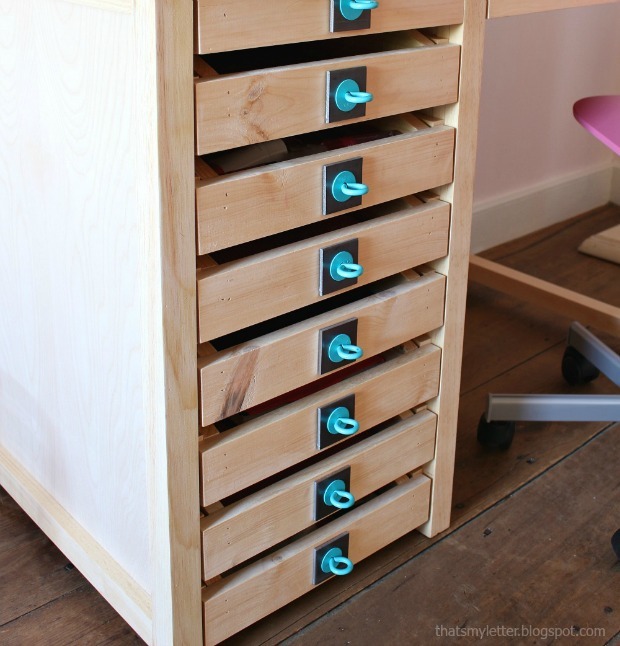 I also lined each drawer with bright colored paper to keep it young and fresh for my daughter. 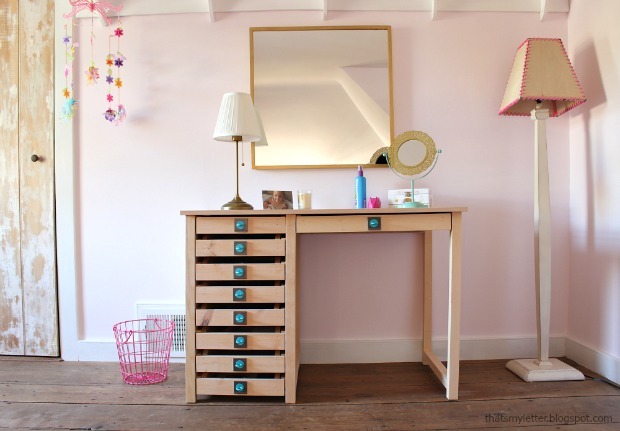 There’s plenty of counter space and storage altogether in a fun vanity desk. 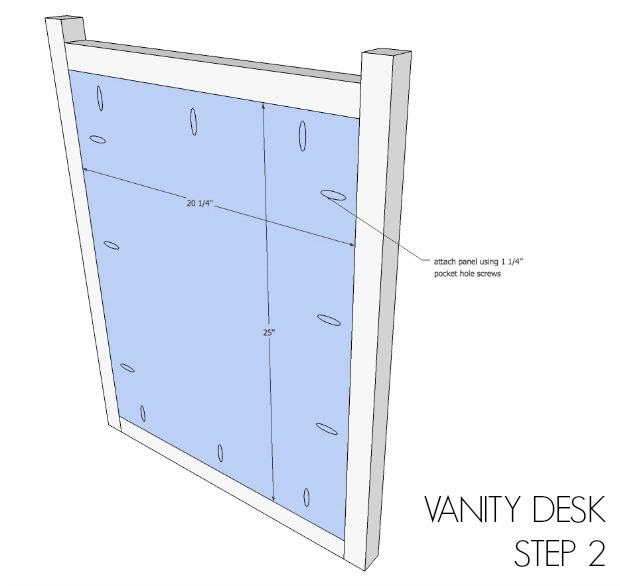 Below is a link to the printable PDF plans for the vanity desk. Be sure to read through entirely before beginning and always follow all safety precautions when using power tools. 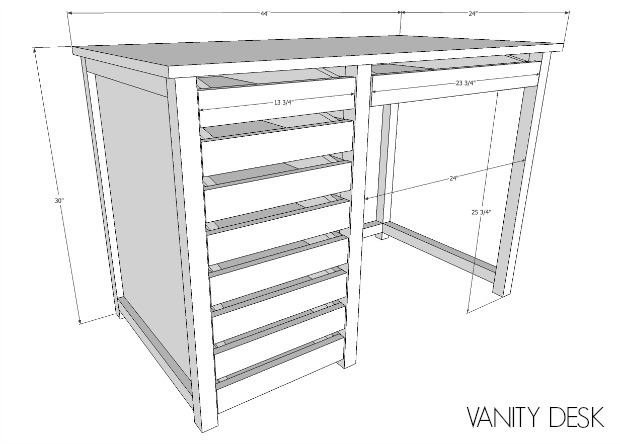 Click here for a printable PDF version of the vanity desk plans. 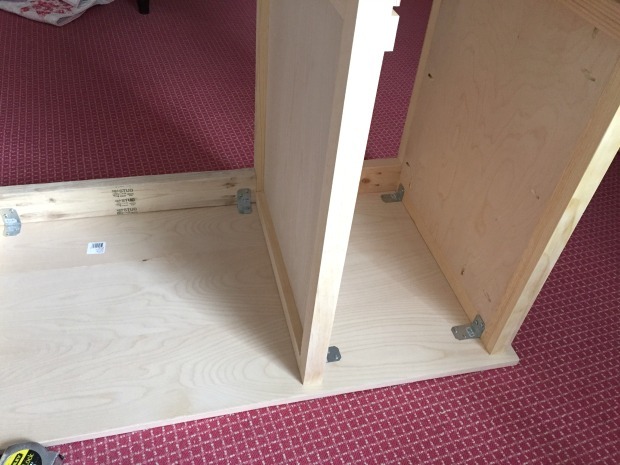 Step 1: Attach cross supports to legs using wood glue and 2 ½” pocket hole screws. Keep pocket holes to underside at bottom and to top side. Step 2: Attach plywood panel into 2 of the leg sets. Using 1 ¼” pocket hole screws keeping panel flush to interior. 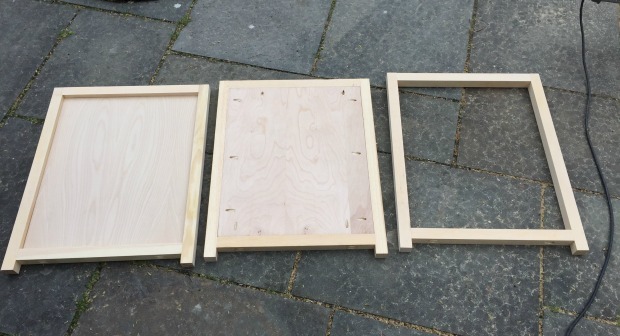 You will have 2 closed side panels and one open frame panel. When attaching the Simpson Strong-Tie® A21 angles be sure to use the Simpson Strong-Tie® SD8X1.25 #8 x 1-1/4″ Phillips Wafer Head Wood Screws into the side panels and 3/4″ wood screws into the desk top. For the remaining steps click here for the printable PDF version. There are 2 drawer sizes in this desk – 8 small going down the left side and one large across the top. 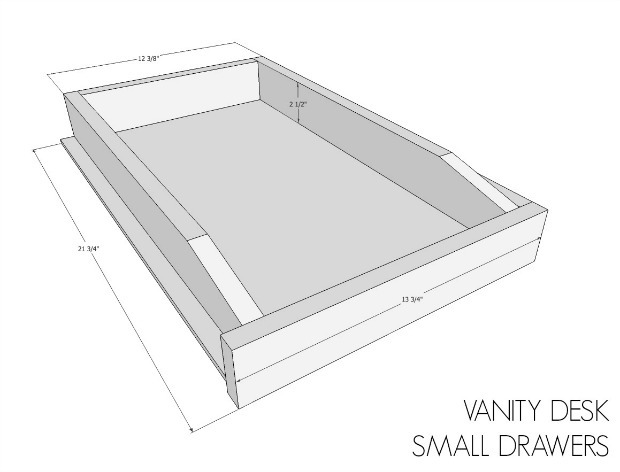 The build process is the same for both sizes just slightly different dimensions on the width, be sure to check your measurements before making any cuts. For the drawer bases I used MDF, it’s cheaper than plywood and more stable in this application. Each drawer pull is made up of 3 parts: 1- Simpson Strong-Tie® Bearing Plate, 1- 1″ fender washer and 1-screw eye. To prepare the hardware pulls I spray painted the washers and screw eyes in bright Rust-Oleum gloss seaside. Predrill a hole at the center of each drawer and begin attaching the pull as pictured above. Use only your fingers, no tools as you don’t want to scratch the paint. 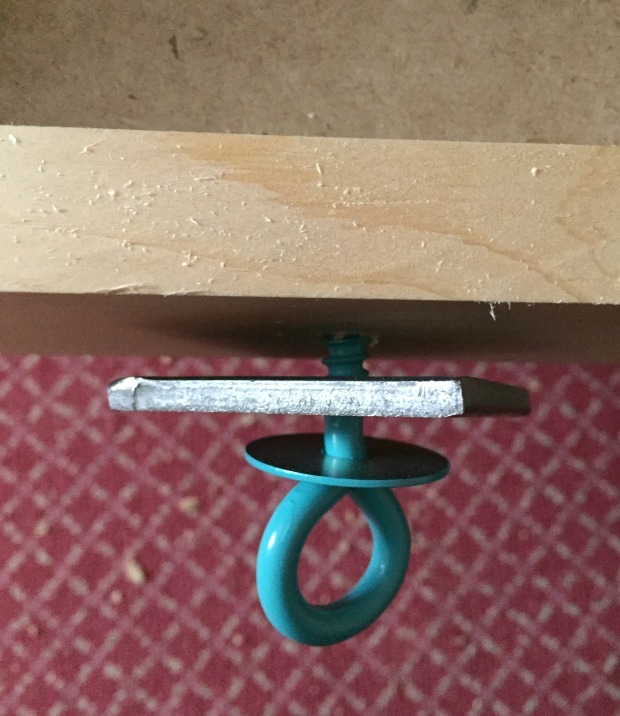 Complete the hardware installation using a wood dowel inserted through the screw eye. This will ensure no scratches from a rough tool on the glossy paint. So fun, modern and fresh for my almost tween girl. And you could paint the hardware any color or leave natural to compliment your furniture finish, the options are endless! Disclaimer: I partnered with Simpon Strong-Tie® to bring you these plans. I was provided compensation and / or product however all thoughts, opinions and creative ideas are my own.